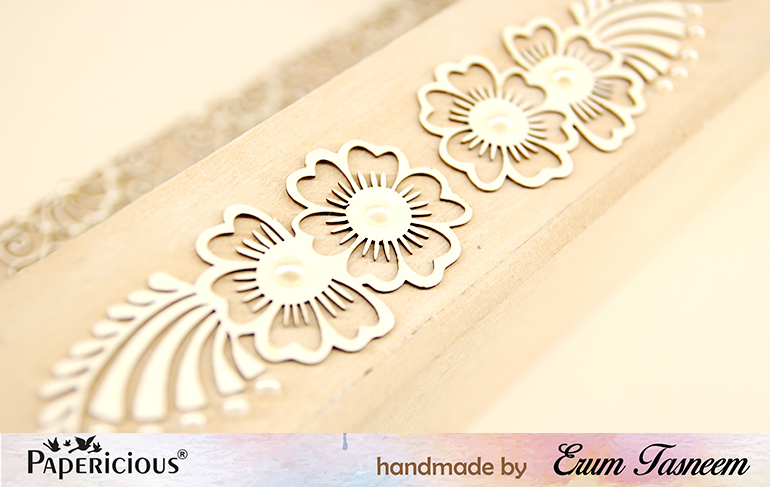 I have a new project to share at the Papericious blog. 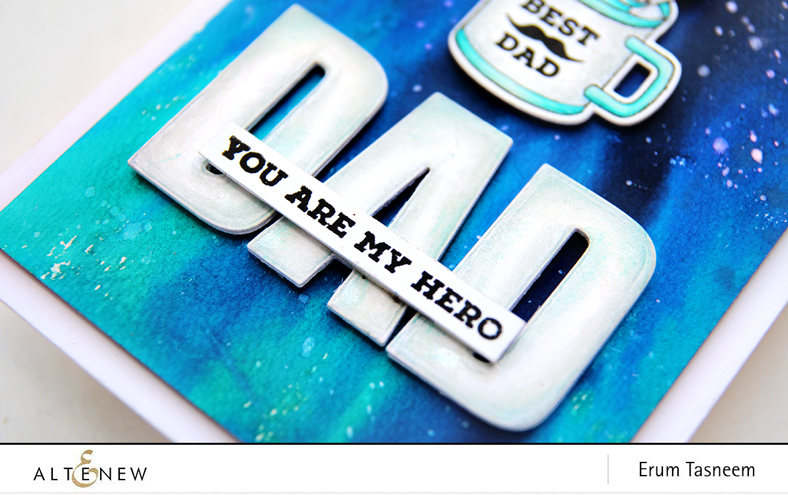 I am so excited to be guest designing for Spellbinders again. 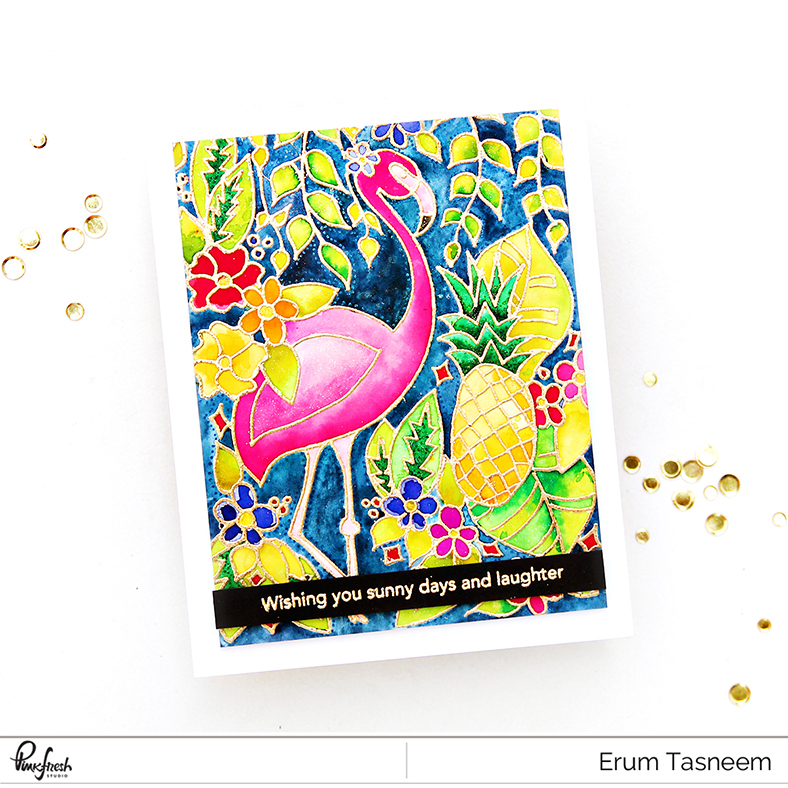 I am sharing a messy watercolour card on their blog. Would love if you check it out. 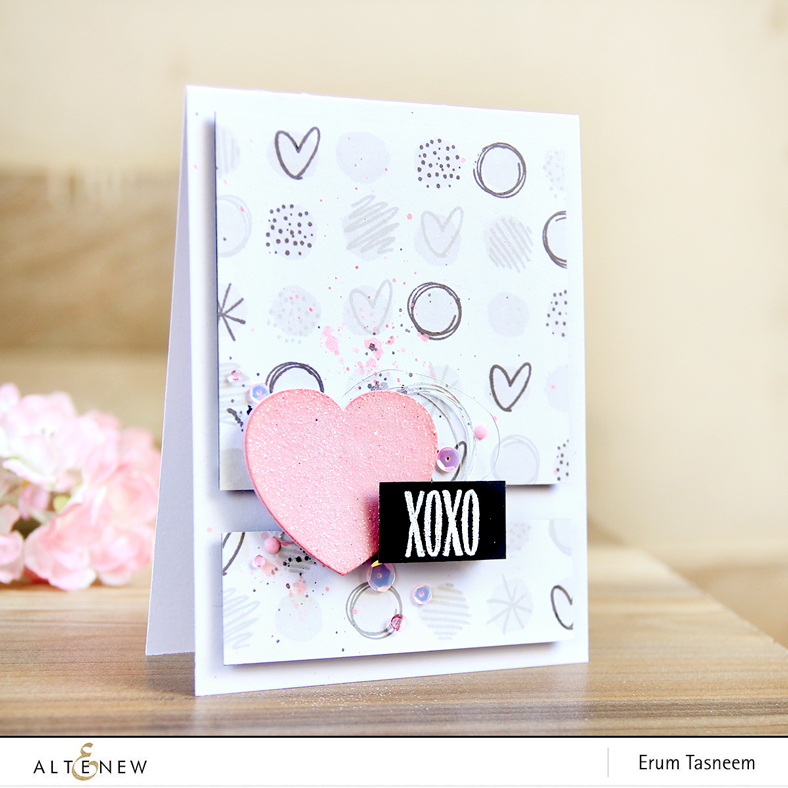 I am sharing two cards over at Altenew today. 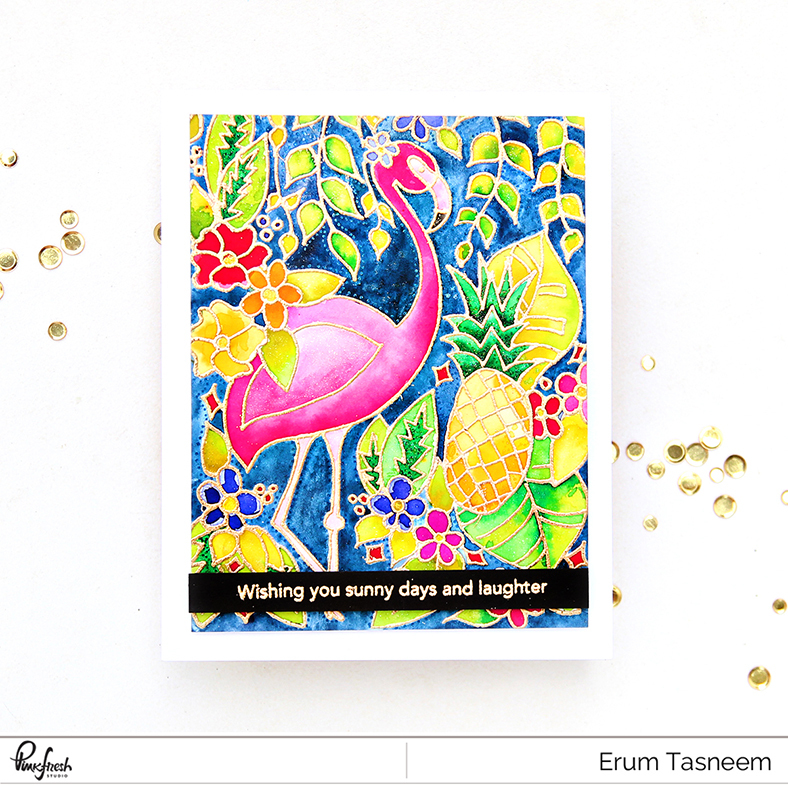 I have a new card to share over at the Papericious blog. You must be here from the Pinkfresh blog. Welcome to our Spring release! 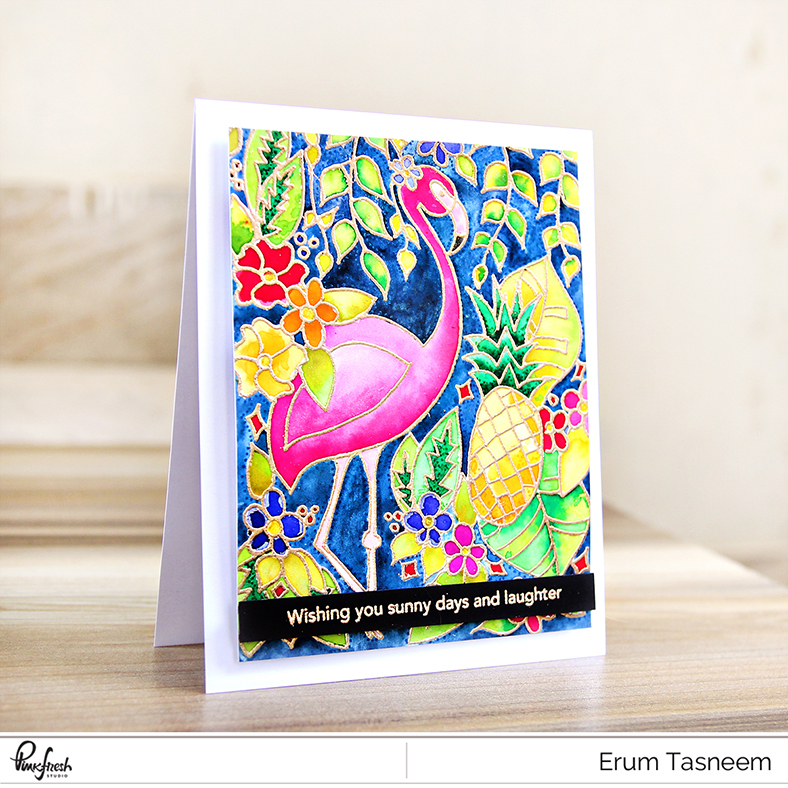 I have one very colourful, vibrant card to share with you today featuring the awesome Let's Flamingle Stamp Set. This ones for you if you love to colour! I heat embossed the image onto watercolour paper in gold. I coloured the piece with distress inks mainly. Only for the dark blue background I used Gansai Tambi. I had so much fun colouring this piece that I made two! For the second one I made a video as well to show you how the card came together. I will post it soon. After I was done colouring, I added some dots with the help of Spica Glitter Pens. And then I went over some leaves and a few other tidbits with Nuvo glimmer pen. I love how it turned out and its SO shimmery too! 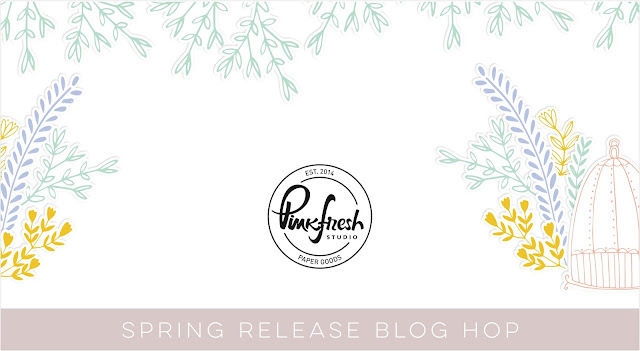 Leave a comment on the Pinkfresh blog and you can win the entire Spring release! There is a chance to win 25$ gift certificate on each stop of the hop! You can leave comments till Friday 4/27 at 5:00 PM CST. Winners will announced on the following Sunday. The next stop on the hop is the seriously talented Zsoka Marko. 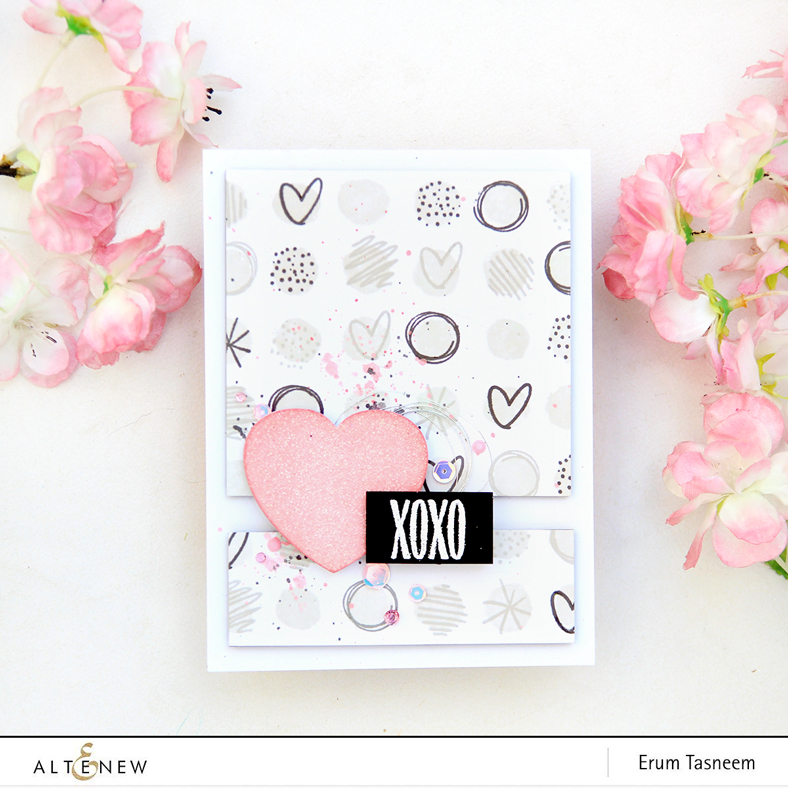 I have a new card+video to share over at the Altenew blog. I also have to announce the winner for April Release. 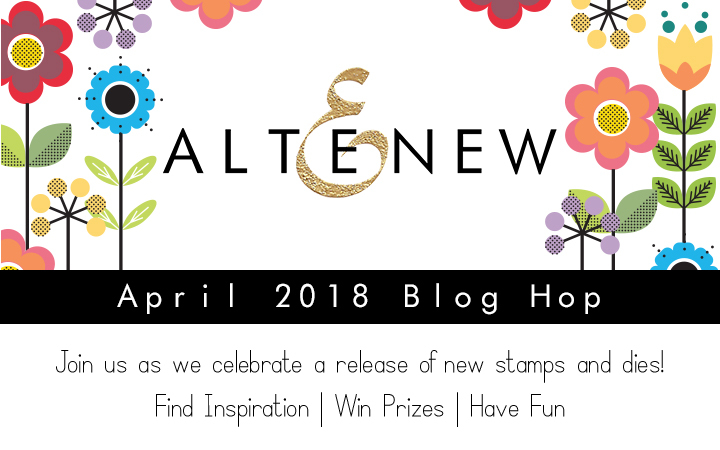 Please send an email at winner@altenew.com by 4/30 with the subject "Altenew April 2018 Stamp/Die Release Blog Hop Winner from Erum's Blog"
Hello everyone! 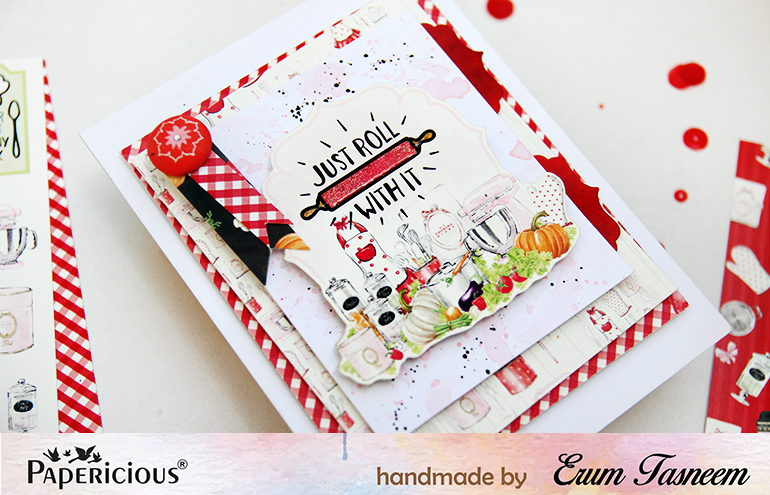 You must be here from the talented Laura Jane's blog. 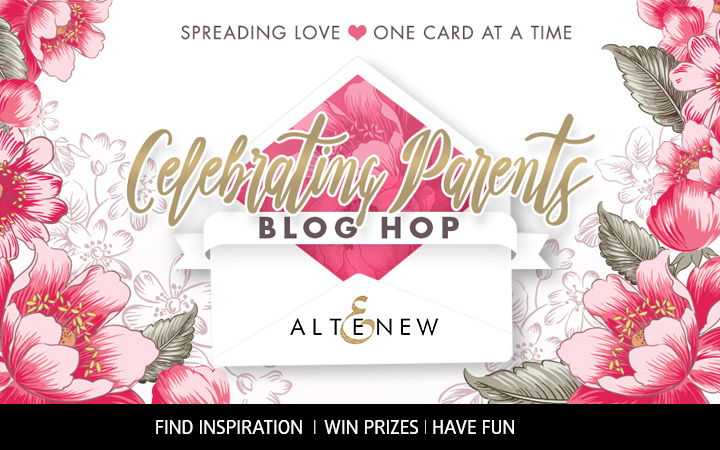 Altenew is Celebrating Parents today! I have a bold blue card to share with you. 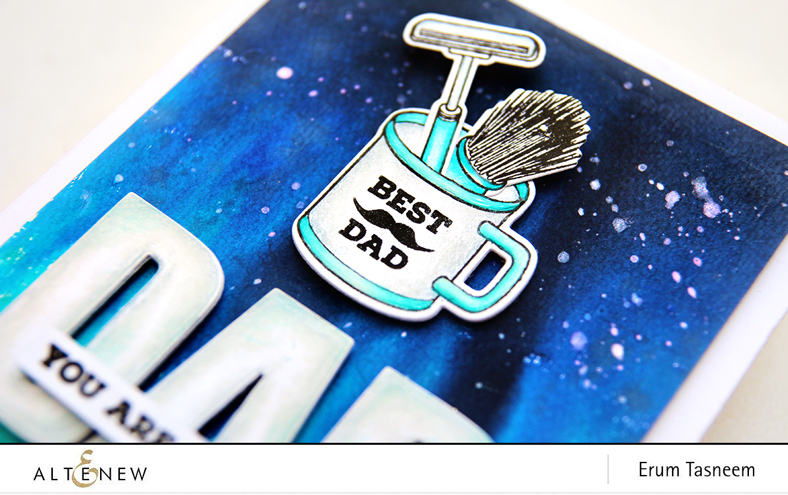 I have used Best Dad Stamp Set on my card today plus Caps Bold Die Set. For my background I have used distress inks in four blue shades. I added some iridescent shimmer spray to my background as well. 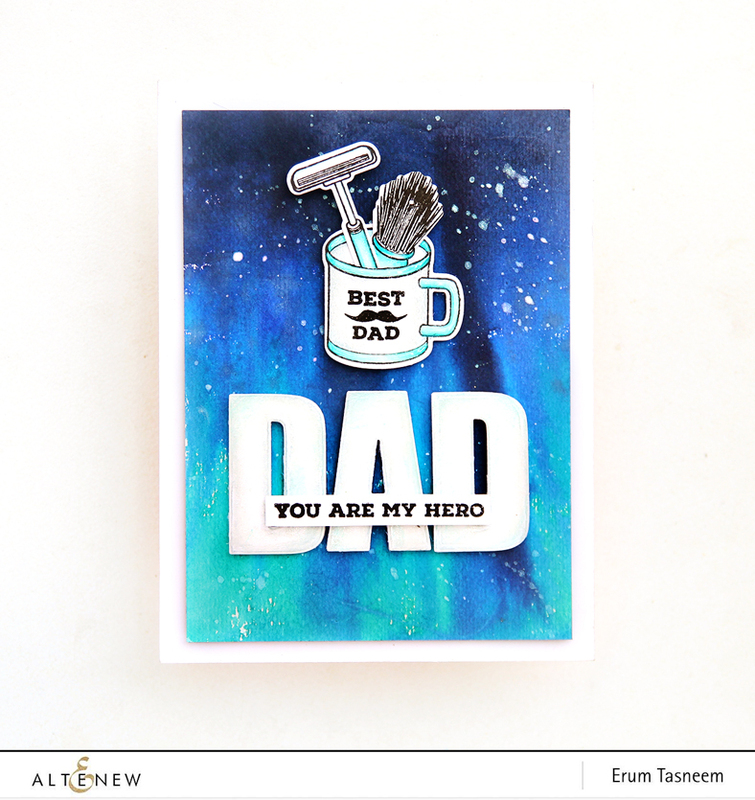 I also used shimmer pen on the "Dad" and the images. 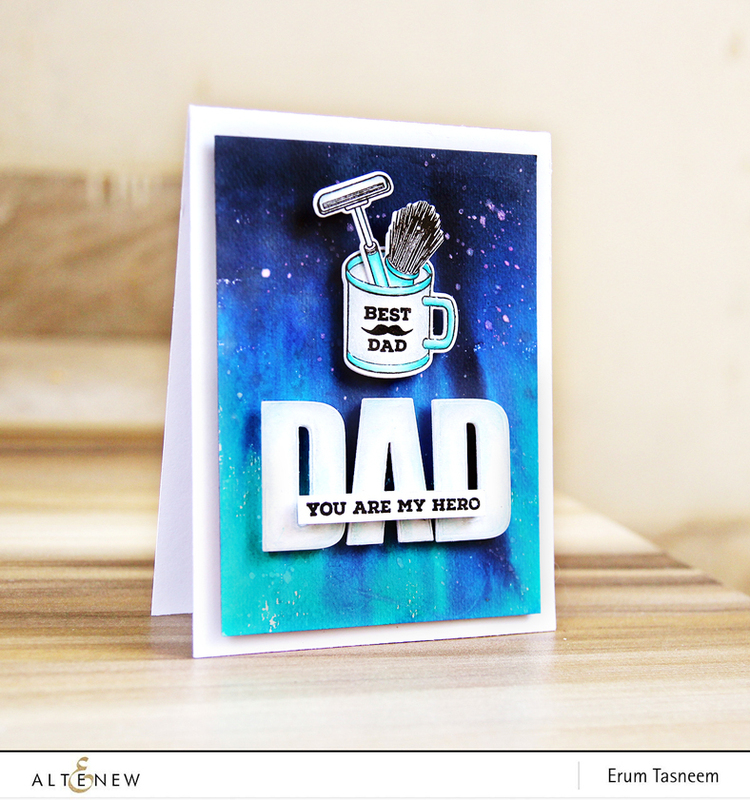 Its a simple card but packs a punch! I will also be picking out a name from the comments left here for $20 gift certificate to the Altenew store. I will announce the winner on 8th May. Now please hop on over to lovely Barb Engler's blog! 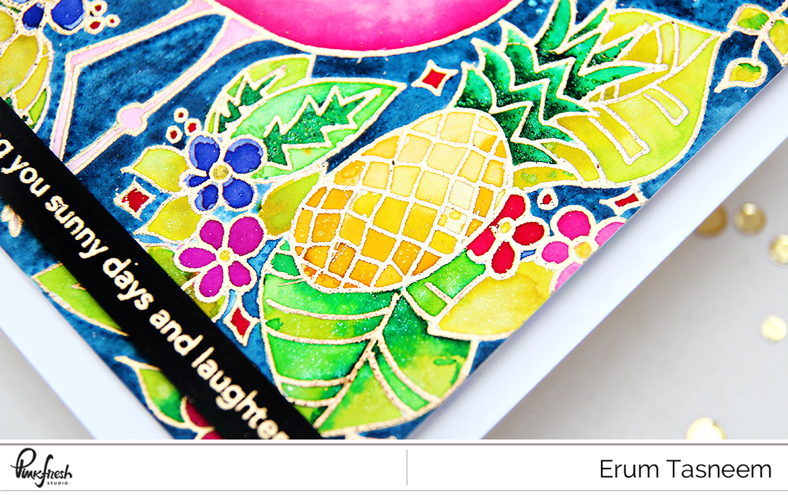 I have a new watercoloured card to share over at the Studio Katia blog. You must be here from the Altenew blog. 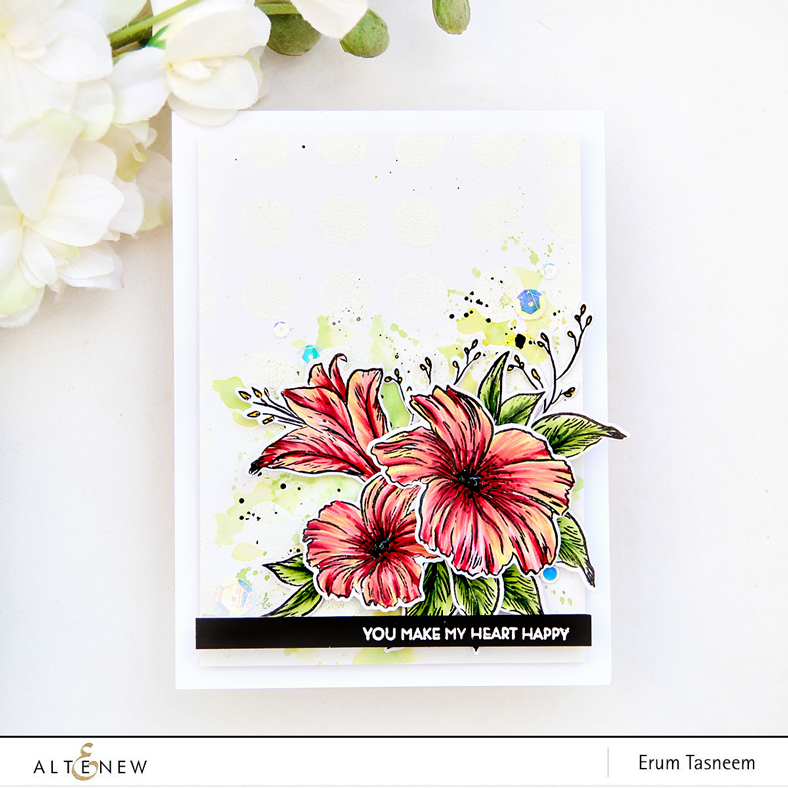 Welcome to Altenew's April Stamp/Die Release! I have a few projects to share with you so sit tight. 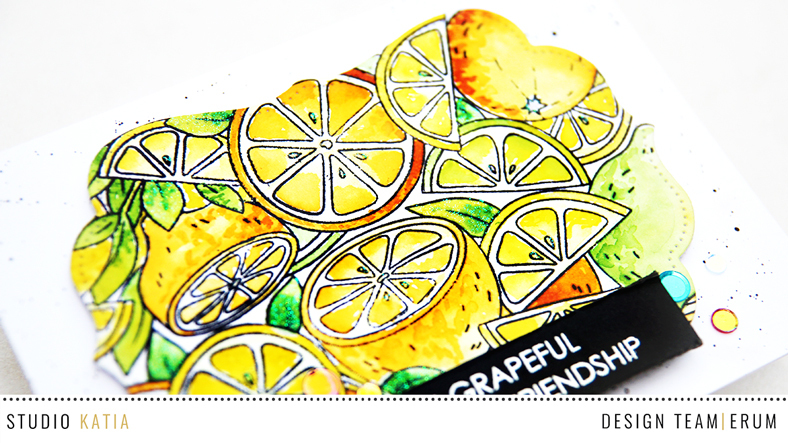 First up, featuring the Mega Hello Die and Mega Greetings Stamp Set. My cards are simple and quick. I inked a panel in rainbow colours and die cut the "hello" die out of it. I couldn't decide if I liked the black or the white better so made both! 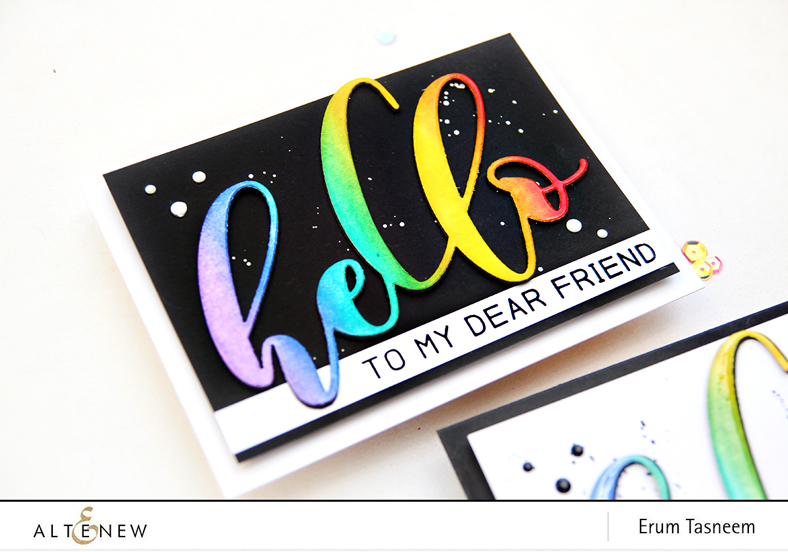 I added tons of glossy accents on my "hello" die cut. 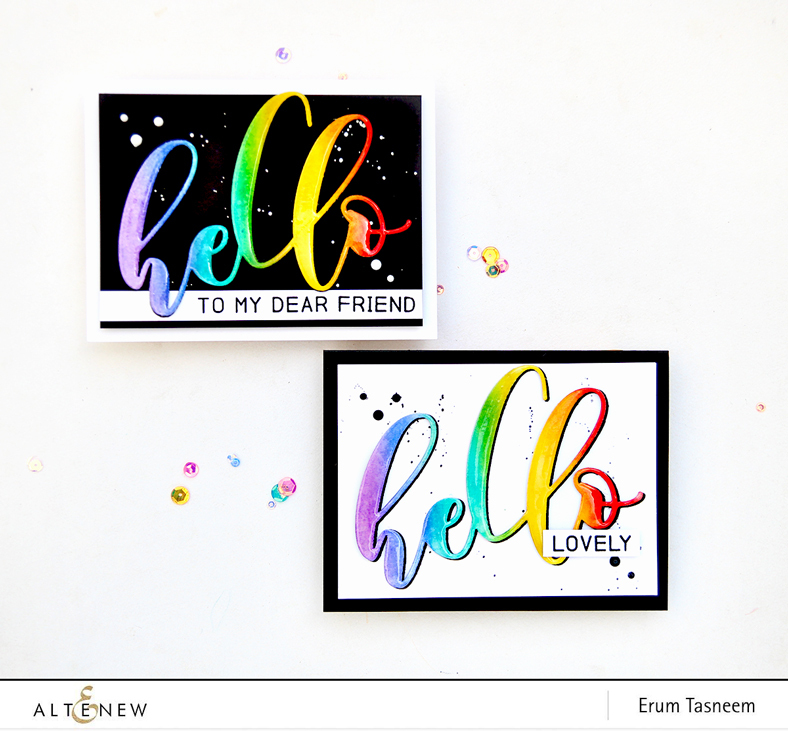 For the one on white, I added a black offset to my colourful "hello". Next up are plain cardstock pieces that I stamped to giveaway to my customers. This is the Mega Greetings Stamp Set. 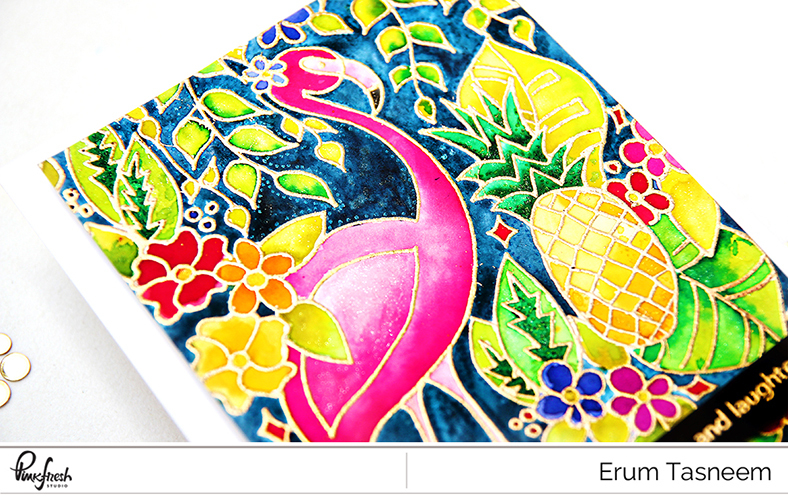 The large thanks die can be stamped using multiple colours of ink for interest. 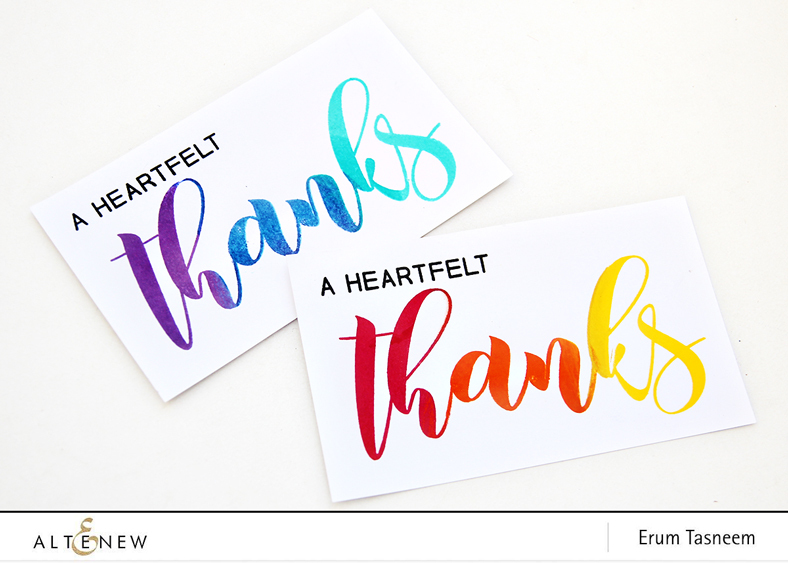 I used several Altenew inks to stamp the rainbow "thanks". I liked the result so much that I went ahead and stamped it using single colour families. 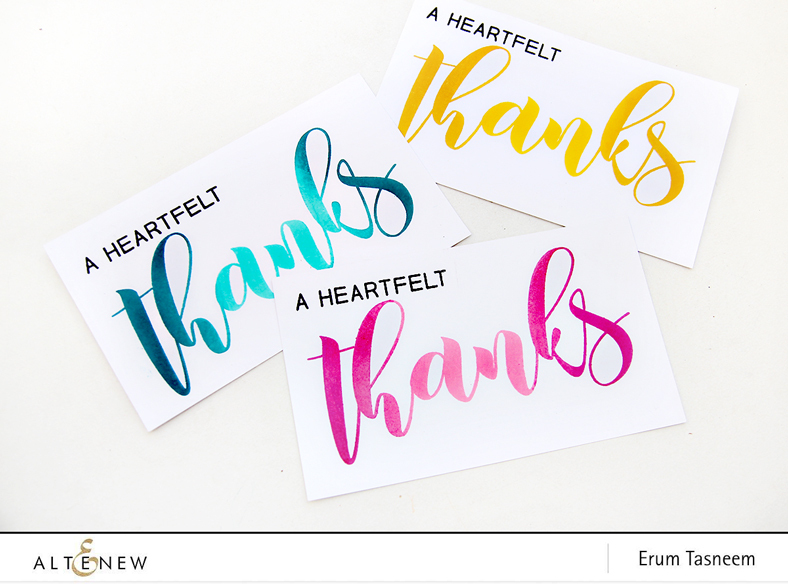 I tried the ombre' stamping look for the "thanks". It looks really cool in person. 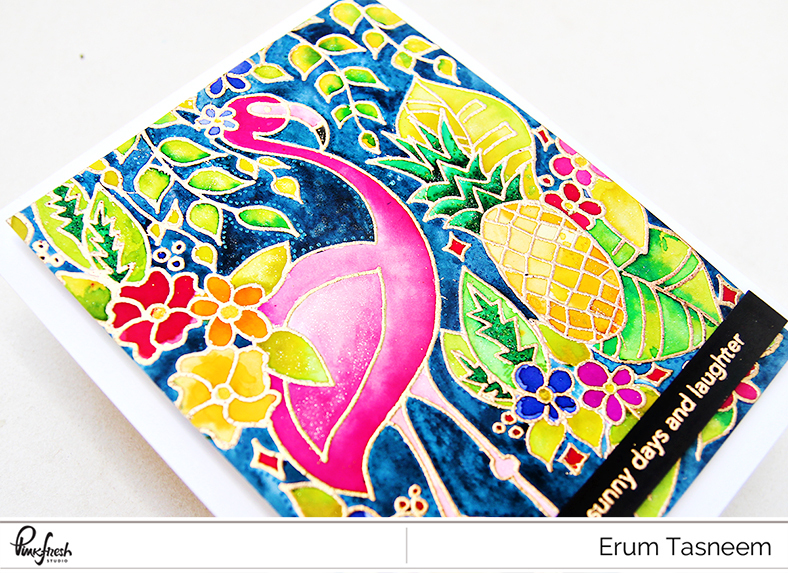 I am sure you can tell I was having fun stamping these! 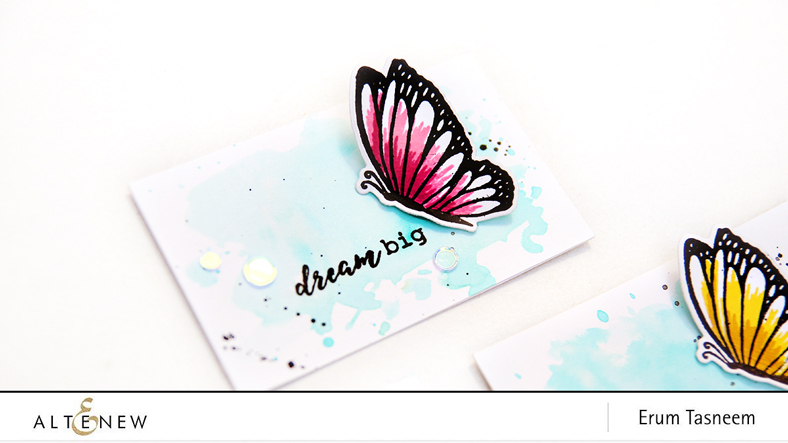 Next up, the small Dream Big Stamp Set. This set is small but Altenew still managed to make this a layering set! I made these tiny tags to send out with cards to my crafty friends. 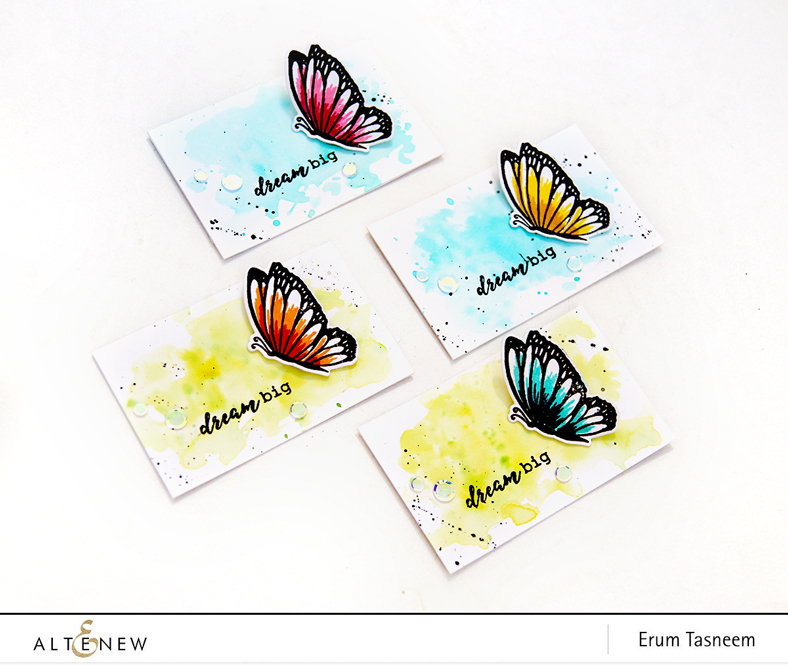 I watercoloured the background roughly with distress inks and then popped the stamped butterfly with glue gun. This stamp set comes with a coordinating die. 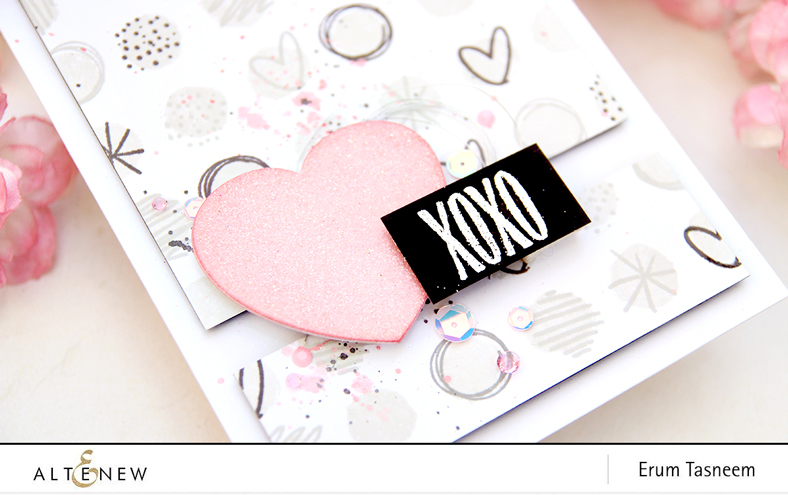 Next up, Watercolour Dots Stamp Set. Isn't this an awesome stamp set?! I had so much fun making this card. I used inks from the Rock Collection for my background. I die cut the heart with Halftone Hearts Die Set and then sprinkled clear glitter on it. I also added some pink and gray paint splatters to my background. And added a bit of silver string as well. 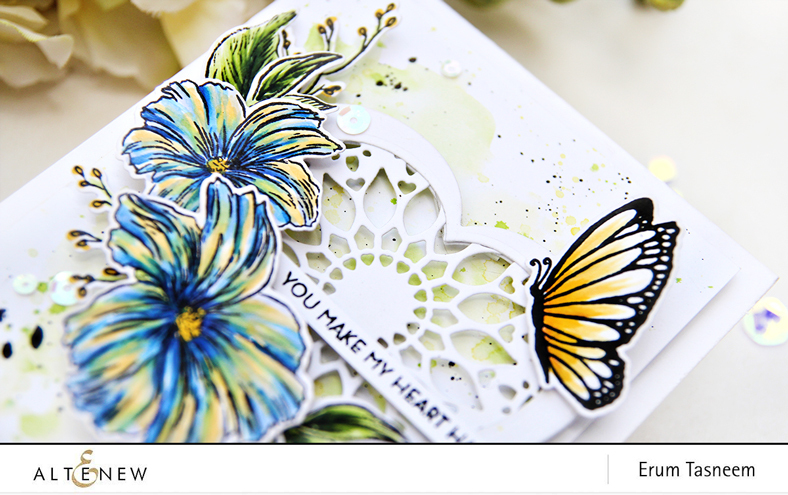 My last card of the day features the Happy Heart Stamp Set and for the background I used Watercolour Dots Stamp Set. 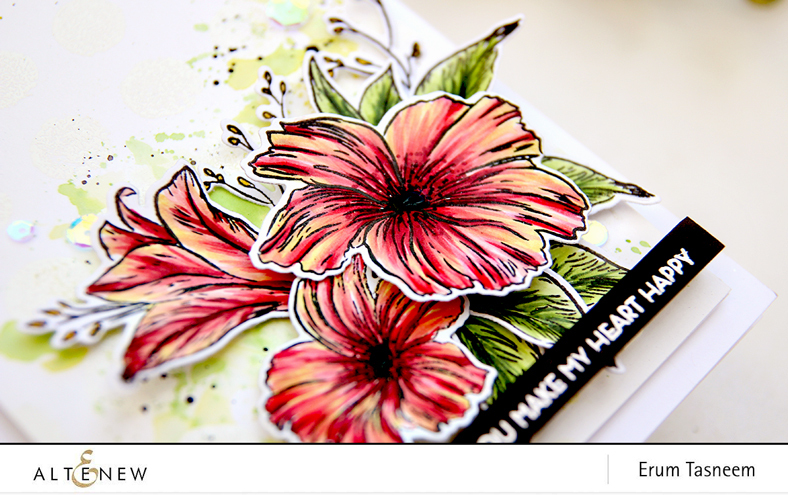 I stamped the images with Altenew Permanent Black Ink and coloured them with Artist Markers. The colours I used are Buttercream, Frosty Pink, Coral Berry and Ruby Red. 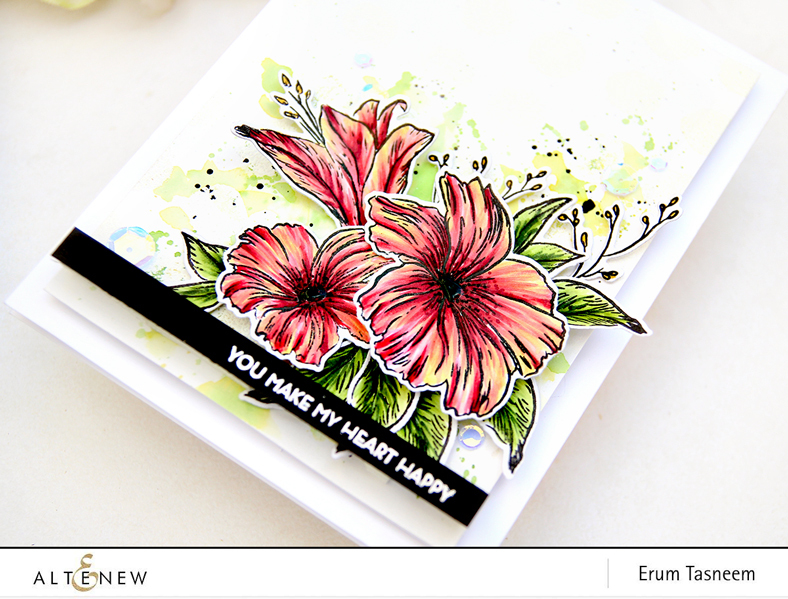 Before arranging my floral spray, I stamped the background using Watercolour Dots stamp set and heat embossed it in white. I then added a bit of watercolour for interest and then popped up the flowers with foam tape. That's all from my side! Now onto some awesome stuff! 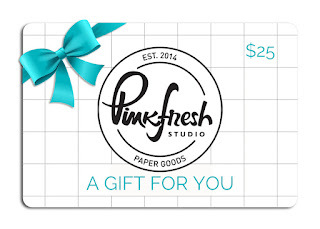 I will also be giving away a gift voucher worth $30 to one of you! I will announce a winner on April 21st. Next stop on the hop is the amazing Kay Miller!